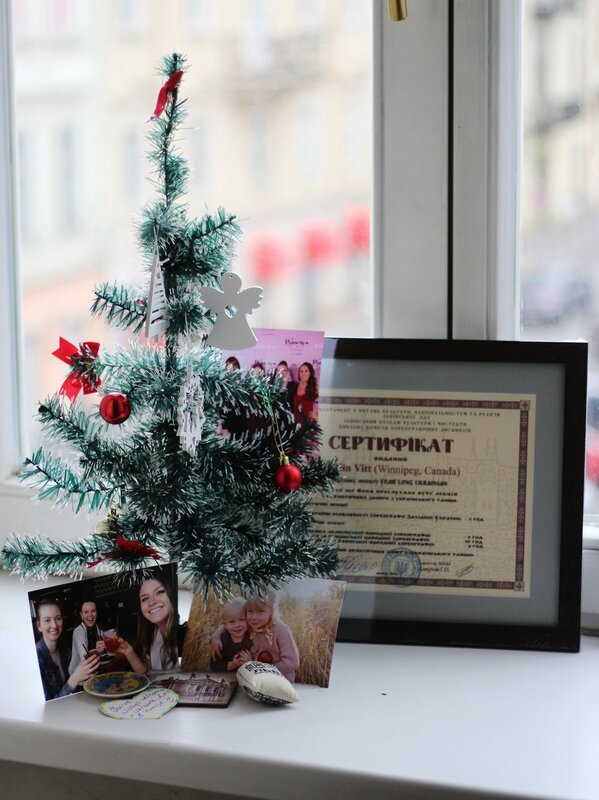 I hope your holiday season was full of health and happiness, and if you're still celebrating (like us Ukrainians), may your stamina be strong (Old New Year's Day is today, but the celebrations aren't done yet!). I've been in Chernivtsi, my new home, for a couple days after spending time in the Carpathian Mountains. I can't wait to share more about my Orthodox Christmas experience (carolers everywhere you look, dinners where the dishes don't stop coming, homebrew, and so much more), so stay tuned for a future post. But before I tell you all about Ukrainian Christmas, I want to tell you about Dec. 25 Christmas, my first one away from friends and family. Maybe I didn't have any gifts under the tree to unwrap, but I have many gifts in this world, no matter what country I'm in. 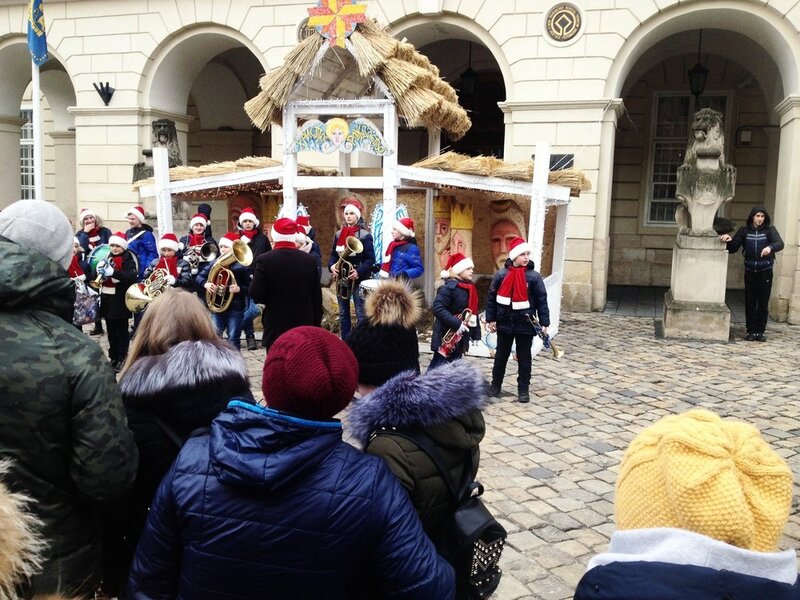 In previous posts, I briefly talked about the Lviv Christmas market, which opened at the start of December. There are wooden kiosks lining the walkway in front of the opera house as well as in Rynok Square where you can buy food, drinks, and souvenirs. Because of the market and because of the decorations around town (decorated trees, garland, sparkly everything), the feeling of holiday spirit in Lviv has been strong, which I wrote about last month for What's On Kyiv. And since the feeling is constant, you kind of forget what you're actually supposed to celebrate, and when. It's nice this way though — people are free to celebrate what they want and when they want to. It also made it easier to be away from family and friends, I guess because at times I forgot it was Christmas. It just felt like some new weeks-long holiday. Moscato wine was my sous chef. It was also the first Christmas away from home for the other Canadians I'm here with. We tried to keep some of our usual style of celebration the same — getting together with family/friends for good food and good times — but we also celebrated somewhat unconventionally to try to distract ourselves. Back in November when I visited family in their village with my sister, they gave me lots of preserves to take home, including beets, which I had yet to use. And since i was moving out of Lviv within a couple weeks, I knew I couldn't let them go to waste. 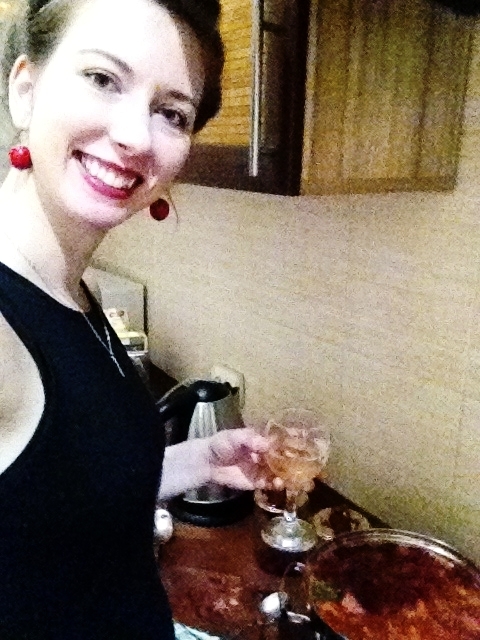 And so, on Christmas Eve, I made borsch for my first time. 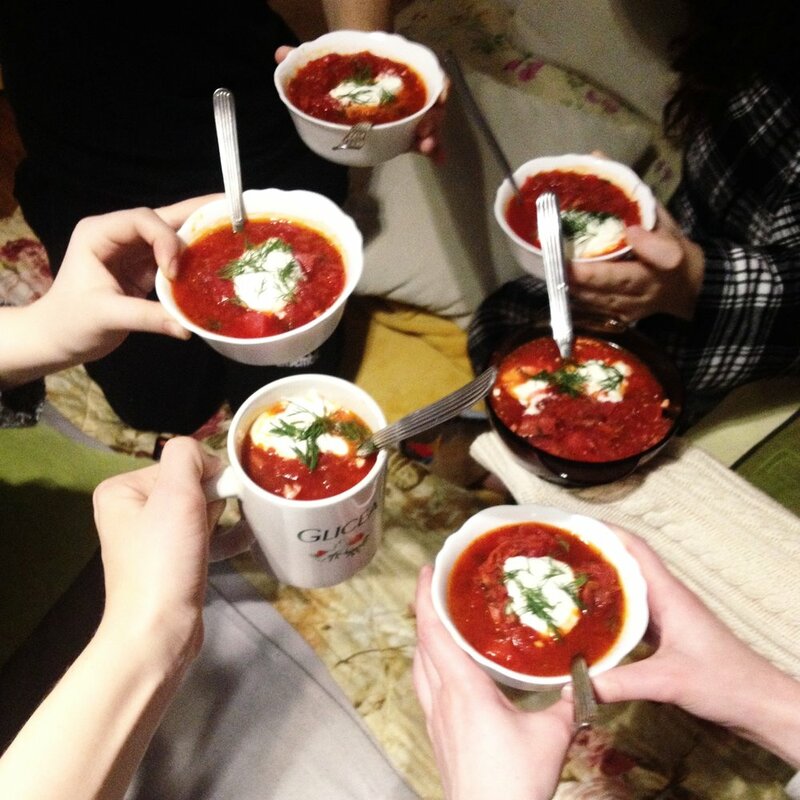 The borsch was delicious, if I do say so myself. I served it to my friends and they agreed. Beginners luck, perhaps. In the evening, I went to mass at the Lviv Latin Cathedral. I figured it would be busy, but I didn't realize just how busy — 15 minutes before it started there was a lineup to get in. And once inside, hundreds and hundreds of people filled the church. It was unlike anything I've ever experienced. Whether you're religious or not, you would have felt inspired seeing that many people together in one place. After listening to some live Christmas music and having a couple of our favourite sour beers, we called it a night. The next morning, hours before my family would get up in Canada (I am eight hours ahead of them), I slept in then went for a walk around Rynok Square. Saint Nick was there, people were singing carols, and an orchestra wearing Santa hats played. I then took myself out for a special Christmas breakfast, because I didn't feel like oatmeal yet again, to Cukor, a popular and delicious breakfast-all-day spot (and one of the few places you can get good pancakes, with syrup yet). I got there at just the right time as I got the last table, and I had a wonderful cappuccino and pancakes while starting a new book (Franny and Zooey by J. D. Salinger). Once home, I sent out a few Christmas messages then went to a friend's place with the other Canadians for food (borsch and cheese and meat and homemade cookies sent from Canada) and movies (Elf and The Grinch) and drinks (leftover cider we didn't get through at our dance ensemble's Christmas/New Year's party). 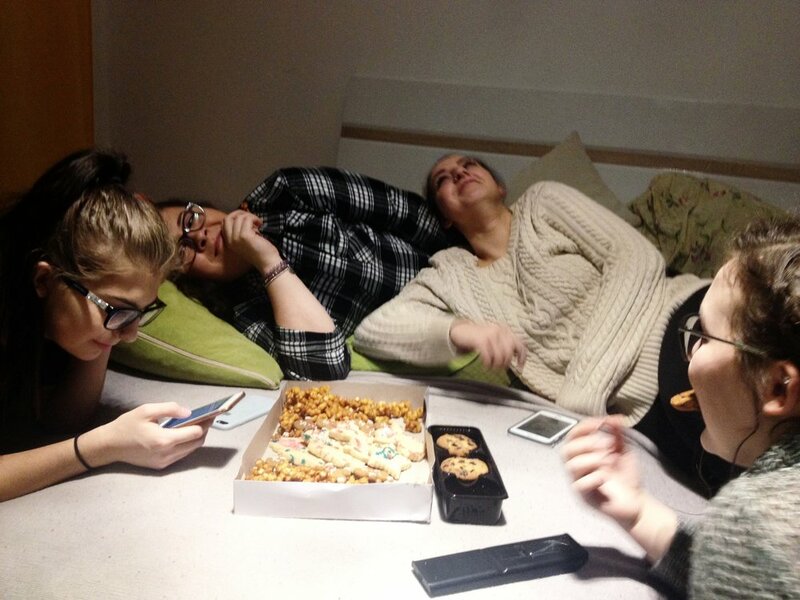 We took a break from each other for a couple hours to talk to our family then we regrouped in the evening for a not-exactly-traditional Christmas dinner: pizza. Then we walked Rynok Square, as we love to do, and handed out some extra Christmas baking family sent. It wasn't a traditional celebration, per say, but all the main things were there — friends, (new) family, gift giving and receiving (I gave borsch and received cookies), and fun.